Back in 2009 I took this photo of myself with EXPERT written on the whiteboard behind me. I had no grandiose scheme when I took the photo. It was taken at the office of z2 Marketing, in the conference room. I’ll admit, part of the reason I took the “EXPERT” photo had to do with a (slight) jab at people who were declaring themselves “experts” at the time. 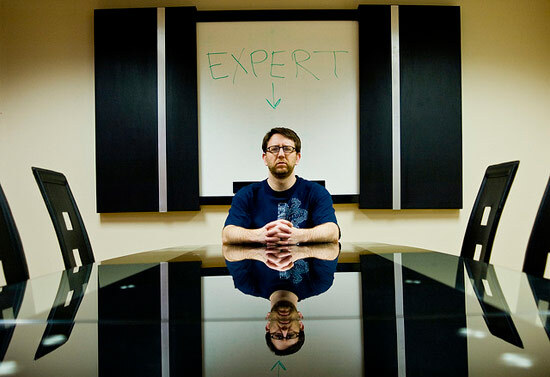 The photo gets used a lot when someone posts an article and needs a photo that depicts an expert or expertise. When the photo is used, people who know me tend to tell me about it, which is nice, as it’s fun to track the usage of the photo. Of course I really do like to get credit for my work, so if you use it, please credit it properly, because I am also an expert in Creative Commons. Now, as far as being an expert, I like to say “You are an expert at your own experience”. This goes back to 2006, when we had one of the first meetings about BarCampMilwaukee. We were discussion session topics and someone said “Well, I’ve installed Linux a few times, but I’m no expert at it.” I then pointed out to the person the fact that he was an expert to anyone who had never installed Linux, and that sharing your own personal experience is an important part of teaching and learning. Through the years of helping make unconferences happen, and getting involved in Milwaukee Makerspace, and in publishing this blog, I’ve come to understand just how important it is to recognize that you need be willing to share the things you know, even if you don’t think you know enough, and you also need to be accepting of others when they don’t know everything, because really, no one does. No one is an expert in all things. Through the open sharing of knowledge, and the willingness to accept that no one is a expert (while we are also all experts) we can all end up learning more than we ever would on our own. Posted on Sunday, January 19th, 2014 at 9:46 am. Subscribe to the comments feed. Both comments and pings are currently closed. Post on your own blog. “I’ve come to understand just how important it is to recognize that you need be willing to share the things you know, even if you don’t think you know enough, and you also need to be accepting of others when they don’t know everything, because really, no one does.” This sentence makes it for me. Well stated article. Jenie, you improved my print making skills by answering just one question I had… that’s it! Luckily I learned even more from you by just talking and asking a few more questions.